What is Psalm 91 all about? What are things that we can learn from it for today? Psalm 91 appears to be a psalm in the setting of warfare with threats of an imminent battle that is about to, has or is currently taking place between solders that may be facing impossible odds. If the face of such a harsh reality as this, God is placed in the position of being the protecting parent of His young as their fortress, shield, and protector. The one who abides in the shelter or under the protection of the Most High God has a shadow over him or her, much like Gods providing the cloud of glory that protected Israel in her wanderings in the wilderness from the scorching sun and like a fortress, He will deliver those who face the snare or trap or the threat of a deadly pestilence or disease. 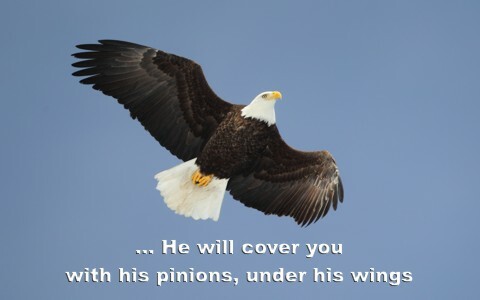 The imagery here is that of God being a protective parent bird like the eagle which covers His young under their wings and shades them from the elements and any prey that might attack them. There is need to fear the night filled with terror or the arrows that are visibly seen flying during the day. There is even the unseen threat of pestilence that seeks their victims under the cover of darkness. At the height of the battle during the noonday sun there is nothing but destruction but under the protection of God’s wings there is a sure refuge and He is the shield that is faithfully there throughout. The buckler is also part of the protection and this device is a defensive piece of armor used in ancient times when close range attacks occurred. Being under His wings and in His fortress and Him as the refuge, the fear evaporates during the terror at night, noon, or any part of the day. Here we read about thousands falling to the left and to the right as in the day when Israel battled ancient nations…the land would be scattered with dead bodies so those who read this at the time it was written had a good idea what this meant. With death all around them God tells them that it will not even come near them because they are not looking at all the dead bodies but their eyes are looking at the Lord Who is recompensing or paying back those who are the enemies. It is only because they have made the Lord God their dwelling place, dwelling in safety and abiding in Him, therefore as their refuge, nothing evil will befall them and no plague will come close to their tents. This is the verse that Satan used to tempt the Lord in the Wilderness to tell Jesus to throw Himself off the highest part of the temple (Matt 4:5) because the angels are commanded to protect Him (Matt 4:6). We know that God gives His angels charge over us but only at His command and they are ministering spirits assigned to minister to His own children (Heb 1:14) but as Jesus said, we should not tempt the Lord by taking advantage of the heavenly host that ministers to us. Many people have told me that only the supernatural intervention by angels commanded by God could explain certain miraculous situations that they were involved with, some having their lives being spared. There has even been protection from the wild predators, snakes, spiders, and a multitude of various other dangerous insects and animals that many have experienced receiving protection from, like Paul when he was bitten by a poisonous snake and should have died (Acts 28:3-5). The end of this psalm recaps any calamity that can happen and when His children are placed in harm’s way He promises to deliver them, to protect them, to rescue them, and to answer them in their time of trouble. Not only does He deliver His own from trouble, He honors them and satisfies them, promises them long life and how long is the life that comes when He shows us His salvation? How about eternity? All of this because He says we know Him by name (v 14) and can call Him Father. This psalm is a powerful chapter when a believer is in a time of crisis. I have read of some soldiers who were in a literal valley of death that read this chapter to feel a little more peace of mind. The ending of all of this is the most powerful of all as God says He will “show him [or her], His salvation.” If you have salvation, all of these other serious circumstances of plagues, night terrors, thousands dropping at your sides or any other threat are only temporary because ultimately, God is our refuge, our fortress, our shield, our buckler, and His love overshadows us and will bring us safely into the kingdom someday. God truly is our fortress and our refuge.